Hailing from Burkina Faso, the Dafra Kura Band fuses the high energy of the griot ancestral tradition and the contemporary sounds of modern African cities sourced from Manding tradition, nomad desert blues, and Afrobeat. Hear the band shine solo before their performances with Baker & Tarpaga Dance Project later in the week. Olivier Tarpaga, artistic director. 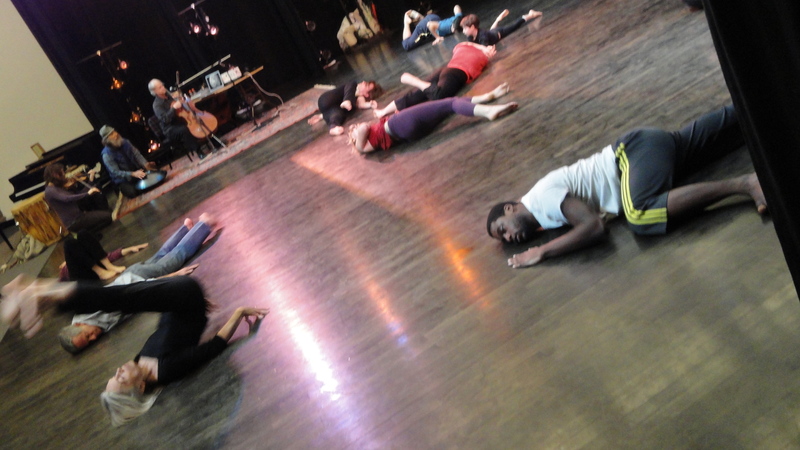 Baker & Tarpaga Dance Project is a recipient of the New England Foundation for the Arts’ National Dance Project Touring Award, with lead funding from the Doris Duke Charitable Foundation and the Andrew W. Mellon Foundation. Tickets: $10 General public and Middlebury ID holders/$6 Middlebury students. (See related events September 28-29). For more information, visit at go/declassified. For more information, visit go/declassified. Hailed by the Washington Post as “one of the best quartets before the public today,” the Danish String Quartet has established a reputation for integrated sound, impeccable intonation, and judicious balance. Their Middlebury debut program includes Bartók’s first quartet, Beethoven’s first Razumovsky quartet, and arrangements of traditional Nordic folk tunes. A Nelson Series event. Reserved seating. Tickets: $28 General public/22 Midd ID holders/6 Midd students. Before settling into Robison Hall for an evening of chamber music by the Danish String Quartet, join fellow concertgoers for a delicious, seasonal meal. Meet friends or make new ones at this catered buffet dinner, seated family style. Meal tickets: $35; cash bar. This internationally renowned violinist has won the Paganini Competition, an Avery Fisher Career Grant, and the Borletti-Buitoni Trust Award. Most of us in Vermont, however, know him as the youngest-ever musician to join the VYO (at age 10), and today as co-artistic director of the acclaimed Lake Champlain Chamber Music Festival. Kim anticipates the release of his new solo Bach CD by performing selections from Bach’s sonatas and partitas for solo violin. A Nelson Series event. Reserved seating. Tickets: $28 General public/22 Midd ID holders/6 Midd students. Back by popular demand, the world’s most renowned a cappella ensemble returns to Middlebury to celebrate its 50th anniversary season. Acclaimed for virtuosity, life-affirming energy, and charm, they present a program surveying five decades of King’s Singers repertoire, plus new works commissioned for this anniversary year. A Nelson Series event. Tickets: $30 General public/25 Midd ID holders/6 Midd students. Formed by four close friends in 2003, this ensemble was named for the famous painter because “Modigliani was something really special . . . an artist who had his own style and stayed true to it.” Aspiring to stay true to their own voices, the quartet plays works by Mozart and Debussy, plus Dvořák’s “American” quartet. Made possible with generous support from the Sunderman Family Concert Endowment Fund, in memory of Dr. F. William Sunderman Jr. and Dr. Caroyln Reynolds Sunderman. A Nelson Series event. Free; no tickets required. A festive occasion for members to gather and celebrate PASS, preview select performances from the 2018–2019 season, and vote on which event to support. Membership information: 802-443-PASS (7277) or go.middlebury.edu/pass. Long requested by Middlebury students, and extolled by the Washington Post as “exuding a sultry sophistication,” the Grammy-nominated Imani Winds are renowned for their dynamic playing, culturally poignant programming, and adventurous collaborations. Their program “Classically Improvised” includes arrangements of Rimsky-Korsakov’s Scheherazade, a Piazzola tango, classical woodwind quintet repertoire, and more. A Nelson Series event. Tickets: $28 General public/22 Midd ID holders/6 Midd students; PASS Members $22 General public/16 Midd ID holders/10 Youth/5 Midd students. Pianist Shai Wosner has attracted international recognition for his exceptional artistry, musical integrity, and creative insight. Described as a “Schubertian of unfaltering authority and character” by Gramophone, Wosner returns to Middlebury with a program of late Schubert sonatas, including opuses 42, 51, and 78, the “Fantasie.” A Nelson Series event. Reserved seating. Tickets: $28 General public/10 Youth (18 & under)/22 Midd ID holders/6 Midd students. Saxophonist, singer, and composer Grace Kelly plays with the heart and passion of an old soul—yet the genre-bending zest and energy of a 24-year-old. A regular on the Late Show with Stephen Colbert’s band—Jon Batiste and Stay Human—Kelly recently released her 10th CD as a bandleader, and performs around the globe. Tickets: $28 General public/22 Midd ID holders/10 Youth (18 & under)/6 Midd students. Praised by World News for her “sensitive, stylistic playing, with great finesse, emotion, and gorgeous tone,” cellist Sophie Shao—a perennial Middlebury favorite—has surrounded herself with some of the most talented artists in music. She returns for her 10th consecutive season with an exciting new ensemble of friends to perform works by Haydn, Bridge, and Dvořák. A Nelson Series event, made possible with support from PASS members Rob and Marny Lichtenstein. Reserved seating. Tickets: $30 General public/25 Midd ID holders/10 Youth (18 & under)/6 Midd students. He is a dark, enigmatic prince obsessed with seeking revenge for his father’s death. She is a steadfast rebel who challenged the powers of the church to restore France to greatness. Iconic figures from two great dramatic classics—Shakespeare’s Hamlet (Friday) and Shaw’s Saint Joan (Saturday)—are brought vividly to life in riveting stripped-down stagings by four actors from the acclaimed New York theatre company Bedlam. Tickets: $28 General public/22 Midd ID holders/10 Youth (18 and under)/6 Midd students. Running time: 180 minutes including two intermissions. NOTE: Bedlam’s productions of Hamlet and Saint Joan will include the company’s signature on-stage seating—seats that change positions for each of the three acts. No participation will be required from those seated on stage. If interested in sitting on stage for one of the acts, please arrive by 7:45 PM and notify an usher. For three decades, Music From China has been at the crossroads of East and West, and has carved a unique place in the music world by playing not only traditional repertoire, but the latest in contemporary works as well. Critics have praised the ensemble as "musicians of extraordinary accomplishment and sensitivity, performing sophisticated, involving music" (Kansas City Star). No strangers to Middlebury, Music From China last performed on the series in 1999, and are frequent visitors to the Summer Language Schools. Their program will feature a quartet of traditional Chinese stringed instruments, including the erhu (2-string fiddle), pipa (lute), zheng (zither), and daruan (bass guitar). A Performing Arts Series event. Tickets: $22 General public/$16 Midd ID holders/$10 Youth (18 and under)/$6 Midd students. *Tickets purchased for the Moody Amiri concert originally scheduled for this date/time will be honored. Mandolinist Josh Pinkham has been named "the future of the mandolin" by Mandolin Magazine, and dubbed "one of the most important young improvisers on the acoustic scene today" by mandolin legend David Grisman. Known for pushing the mandolin into new and old territory--excelling in Bluegrass, Newgrass, Jazz, and Classical music--Pinkham's trio will be rounded out by acclaimed, in-demand, ensemble players bassist Ethan Jodziewicz and guitarist Jason Borisoff. Patrons will also be treated to a special opening act by singer-songwriter Aidan O'Brien, Middlebury class of '20. A Performing Arts Series event. Tickets: $22 General public/16 Midd ID holders/10 Youth (18 & under)/6 Midd students. *Tickets purchased for the Jeremy Kittel Trio/Kittel & Co. concert originally scheduled for this date/time will be honored. In 2015, internationally acclaimed cellist Steven Isserlis and harpsichordist Richard Egarr released a celebrated disc of baroque viola da gamba sonatas, which the Strad called “a revelation of simple beauty.” The duo opens the eighth Middlebury Bach Festival playing these sonatas by Boccherini, Scarlatti, Handel, and Bach. A Bach Festival and Nelson Series event. Reserved seating. Tickets: $28 General public/22 Midd ID holders/10 Youth (18 & under)/6 Midd students. Before settling into Robison Hall for an evening of baroque music by Steven Isserlis and Richard Egarr, join fellow concertgoers for a delicious, seasonal meal. Meet friends or make new ones at this catered buffet dinner, seated family style. Brazilian percussionist Cyro Baptista has performed on five Grammy-winning albums and toured with the likes of Yo-Yo Ma, Trey Anastasio, Herbie Hancock, Sting, and Paul Simon. In Middlebury, he leads his winsome quartet—Banquet of the Spirits—on a virtuosic trek through Afro-Brazilian beats with improvised jazz, akin to a carnivalesque stew of joy and irreverence. Tickets: $22 General public/10 Youth (18 & under)/16 Midd ID holders/6 Midd students.